Why Does Your Business Need Branded Clothing This Year? Quality Branded Hoodies from Rock-It! Quality branded training kits made to order! How to order your branded clothing from Rock-it! Why does your business need corporate clothing? It's our first blog of 2018, first of all Happy New Year to you all! 2018 promises to be another hugely exciting one at Rock-it! Promotions, we are continuing to grow year on year. In this blog we will look how we help businesses across the UK & Ireland with their branded clothing, the benefits and how you can get yours from Rock-it! Promotions. First things first, why wear branded clothing? Branded clothing is a low cost marketing tool for your business. It is a great way to grow your businesses brand and gain exposure to a wider audience while maintaining a smart, professional image. A branded uniform is likelier to leave a longer impression on a customer than a casual attire. We have put together FIVE reasons how we help businesses with their branded clothing & workwear. Our website makes ordering branded clothing simple. We have 1000s of garments available to browse on-site, simply pick your garment, add your logo and checkout - then leave the rest to us. The Rock-it! website ensures you can check out in a few clicks. We also have the ability to set your business up its very own online public or private portal full of your clothing at your prices, simply get in touch for more info. Here at Rock-it! we aim to provide our customers the best selection of garments at the most competitive prices. We provide a number of industry leading brands for our customers offering a huge selection of styles & colours on every type of garment. Our range will offer a garment for every purpose and every budget. Whether you are a start up or large organisation we have a style of garment that will be fit for purpose for you. Rock-it! has a focus on providing excellence to all our customers, we deliver great quality products at great prices. We want your logo and personalisation to look the part, after all it is all about looking smart and professional. Using the latest print & embroidery technology our experienced technicians ensure your branded workwear/clothing look a cut above the competition. All our orders are quality checked before being dispatched, we make sure you look the part. We work with a number of businesses across the UK & Ireland producing branded workwear and PPE. Rock-it! supplies a huge selection of hi-visibility clothing, hard wearing polo shirts, sweatshirts, hooded jumpers, work jackets, overalls and work boots. Our in-house team brand a large amount of workwear & PPE ensuring your work uniform looks smart. Rock-it! provides PPE & Workwear to customers ranging from local start ups to national companies, we can put together a competitively priced quote for you. Last but by no means least we offer businesses great value - no unnecessary extra charges, all our online prices include the cost of your logo & delivery. Rock-it! offers our customers competitvely priced clothing, simply have a chat with our team to see how we can help your business today. Summer is well and truly over and Autumn is here, the dark nights are drawing in and the temperatures have dropped. Keep your warm this Autumn but also looking smart with some of our high quality knitwear. In this blog we will look at Henbury, one of the many brands Rock-it! Promotions offer. Henbury provides a high quality range of garments ideal for corporate customers/staff uniforms that we can brand to give a professional look. What do we have available? Rock-it! supplies a large collection of knitwear, jumpers, cardigans, polo shirts, shirts, trousers and shorts. All our Henbury products are available on-site, simply view our range and the styles/colours we have available by typing 'Henbury' in to the search bar. All our Henbury garments are available to be printed or embroidered. For the high quality knitwear, we advise on embroidery as it provides a higher quality finish displaying your logo/text. For more on this do not hesitate to give us a call to discuss the best method for your garments, our expert team can advise on the best solution for your Henbury products. It is completely up to you... all our range is available online to order in a few clicks, or you can email/phone to place an order directly to the team. Once you have placed your order, we will simply send you a visual of how your knitwear will look and once you are 100% happy we aim to dispatch to you in just 7-10 working days! Here at Rock-it! 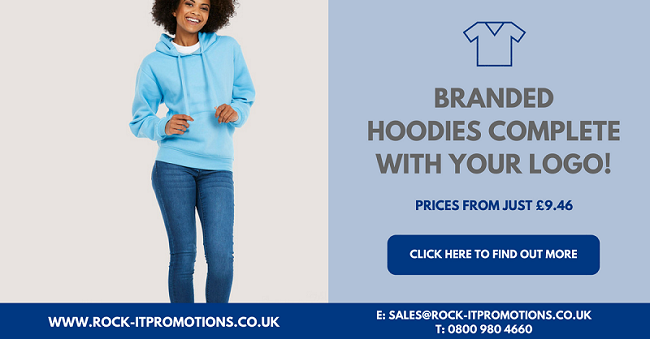 Promotions branded hoodies are one of our best sellers; and of course why wouldn't they be - they are versatile, comfortable and great value for our customers. We supply 100s of leading brands to businesses, schools and clubs across the UK and have developed quite the reputation for delivering quality branded hoodies. 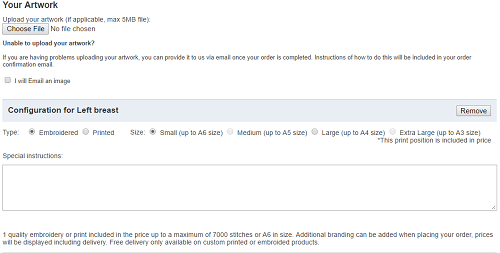 Using the latest printing and embroidery methods our personalised hoodies are finished to the best standard. Our designers can work with you to turn your ideas into a reality, we use a number of leading suppliers including Gildan, Fruit of the Loom and Uneek and offer a selection of branding options to make your garment look the part. All our hoodies are available to be branded with your design, we have a huge selection of hoodies for men, womens, kids & unisex in a number of styles - zipped, half zipped, contrast and much more. To view our range of hoodies click here. 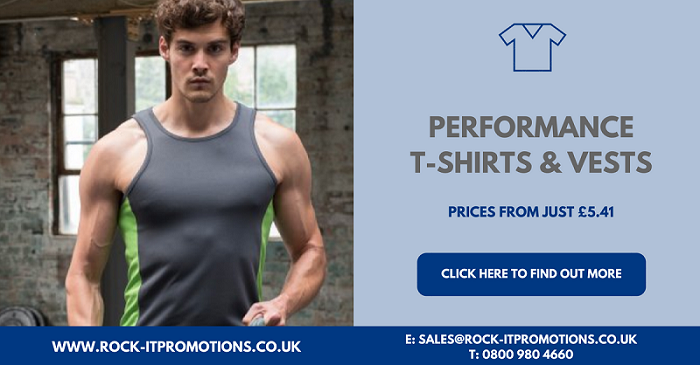 For more information simply get in touch, you can give us a call on 0800 980 4660 or email sales@rock-itpromotions.co.uk to see how we can possibly help you today. With over 100 products in our training range Rock-it! has a wide selection of technical tees and performance polo shirts waiting to be branded with your logo. Using the latest breathable fabric technology our selection of breathable clothing ensures you stay cool while working out in the sun. All our training-wear is available to be branded with your sports clubs/teams logo and personalised exactly to your specification. Both print and embroidery are built into our online price, so make huge savings today. Here at Rock-it! we help a number of clubs, teams & schools in and across Northampton area with their sportswear and training-wear. If you are unsure of what the best performance garment is for you simply get in touch with our team and we will be able to find something to suit your budget and specification. We have a variety of products, colours & finishes available this summer and pride ourself on providing the most compehensive selection in town. Here at Rock-it! Promotions we aim to provide the most complete service for all our customers, from enquiry through to production and aftersales we provide a quality experience throughout. We have a number of categories on-site, simply select a product category and pick a garment from the wide selection available. The website displays all the positions each garment can be branded, click 'add branding' and then select print/embroidery and select a size. Simply add your item to the basket, checkout and relax! Once we have received your order, our team get back to you with a visual proof of how your garment will look and only once you are 100% happy we put your order into production. We then aim to deliver your branded clothing in 7-10 working days (subject to artwork approval) but if there is a specific deadline do not hesitate to get in touch to see how we can help with your branded clothing.